You will also need a 125g mooncake mold and 6 pieces of round 3½ inch (9 cm) diameter parchment paper. Divide lotus seed and black sesame seed paste into 6 equal portions of 80g each. Roll into a ball and set aside. Combine water and pandan paste in a measuring cup. Mix well. Combine glutinous rice flour, powdered (icing) sugar, and vegetable oil in a large bowl. Pour in the prepared colored and flavored water. Mix to form a soft, oily dough. If it is too wet, add a little more glutinous rice flour. Divide dough into 6 equal portions of 55g each. Reserve any remaining for patching if needed. Flour your work surface and palms with glutinous rice flour. 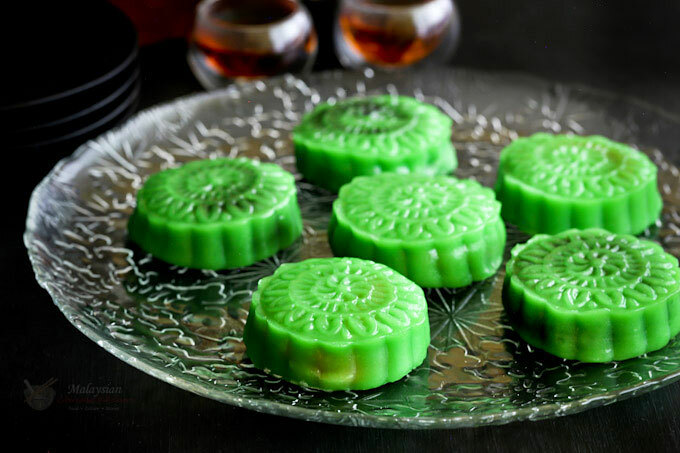 Dust mooncake mold with glutinous rice flour. Flatten a ball of dough into a circle of about 3 inches in diameter on your palm. Place a ball of filling in the center and wrap dough over the filling. Roll between your palms to form a smooth ball. Place ball of dough and filling into the mooncake mold. Press gently to conform to the mold. Overturn the mold onto a piece of prepared round parchment paper. Press the spring stamp down to form and shape the mooncake. Then slide the mold up to release the formed mooncake. Place mooncake in a steaming rack. Repeat with remaining dough and filling. Prepare and steamer with sufficient water at the base. Bring water to a boil. Place steaming rack over the water. Place a clean kitchen towel over the top to prevent water from dripping onto the mooncakes. Place lid over the towel and steam mooncakes for 10 minutes. Remove and allow mooncakes to cool before cutting and serving. These mooncakes are best consumed the day they are steamed. Store uncooked mooncakes in air tight containers in the refrigerator for up to 3 days. Only steam when ready to eat. Tip: Snowskin mooncakes tend to harden after a day or two. They taste wonderful pan fried with a little oil in a non-stick fry pan.